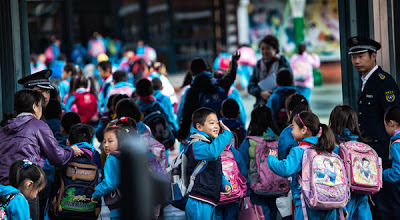 "For Chinese children and their devoted parents, education has long been seen as the key to getting ahead in a highly competitive society. But just as money and power grease business deals and civil servant promotions, the academic race here is increasingly rigged in favor of the wealthy and well connected, who pay large sums and use connections to give their children an edge at government-run schools. Nearly everything has a price, parents and educators say, from school admissions and placement in top classes to leadership positions in Communist youth groups. [...] Corruption is pervasive in every part of Chinese society, and education is no exception." The President ~ NatGeo Spotlights Giant Sequoia! Picturing SF ~ Essential Sci Fi Visuals & Images! Autom ~ Crowdfunding Robocoach via Indiegogo! Within Two Worlds ~ Goldpaint's Timelapse Arc! Dust to Dust ~ Burning Man 2011 Timelapse! DJ Focus ~ Sierra Leone's Kelvin Doe @ MIT! bebionic3 ~ Ackland Shares Myoelectric Hand! Little Bits ~ MIT Alumna Ayah Bdeir CNN's Next! Handybot ~ High-Speed Robotic Hand Demo! MITHenge ~ Photonic Fireworks Tonight-Now! Hangover Heaven ~ Doc Cures Overindulgence! Engine Rebuild ~ Timelapse Teardown & Re-Up! Scariest Flights ~ Fasten Your Seatbelt Films! Star Wars Rules ~ Docu's on Epic SF World! Phobos ~ NASA Shoots Doomed Martian Moon!